Most of those suffering from spinal cord injuries and other physical difficulties such as Polio, Visual Impaired,Speech Impaired, amputees, etc. are from poorer backgrounds and work as manual laborers. Many patients at CRP are unable to return to their previous job after suffering paralysis. If a spinally injured person cannot earn a living to support his or her family, the physical and emotional rehabilitation at CRP will be of little value. To address this need CRP runs vocational training projects which aim to enable trainees to live financially independent lives. CRP's Madhab Memorial Vocational Training Institute (VTI) was established in 1999 and now offers courses at five CRP centres in Savar, Ganakbari, Chittagong, Rajshahi and Barisal. VTI works comprehensively in assessing the needs of a potential trainee, securing a place in an appropriate course and assisting with job placements on completion of the course. The vocational training is free of cost including food, accommodation and training materials. VTI supports the trainees with medical and assistive devices and equipment for self- employment. Three trades certificate come from the Bangladesh Technical Education Board (BTEB). The trainees also get opportunities to take part in National & International competitions. VTI ensures a job after successfully completing the training. 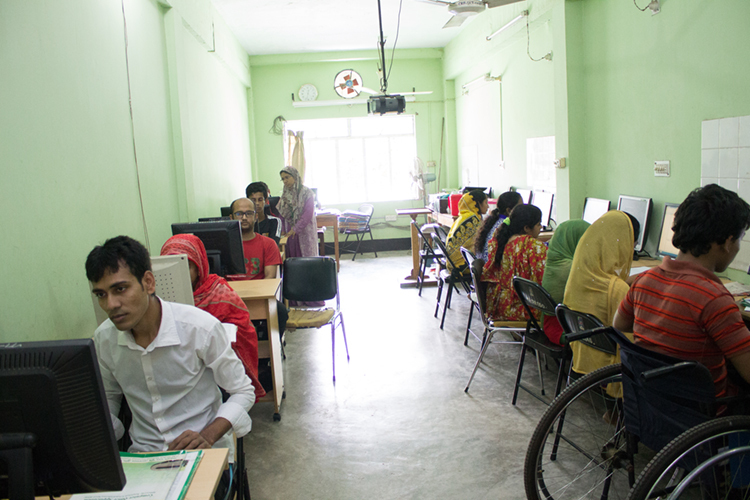 Marks & Spencer is a buyer of UK and their Bangladeshi suppliers support the disabled people's training costs at CRP and ensure their job after completing the training. More than 600 people are now working at 45 different garment factories all over Bangladesh. Mark & Spencer is looking forward to employ more highly skilled people, who were trained at CRP, in this challenging job in the future. Post training follow-up is an important part of assessing the impact and continuous development of the programme. This is done through home visits and by sending questionnaires. Become A Donner - Your donation can bring hope to person with disabilities.